After winning the weekend series vs. Texas, the Toronto Blue Jays opened a 3 game series vs. divisioin rivals Baltimore Orioles. Baltimore won the season series 12-7 in 2017. The Orioles come into the series looking to gain some ground in the AL East after a tough 4-6 record through their first 10 games. Here is tonight's game recap. Due to the Morales injury, Josh Donaldson moved from 3B to 1B defensively. Donaldson last played first base for Oakland in 2012. Regular first baseman Justin Smoak was DH'ing today, so if the Blue Jays had shifted him to the field, pitcher JA Happ would have had to bat. The big difference between third base and first base is having to receive throws, potentially off the mark. First baseman also have to field grounders to the pitcher who is running to cover the base, at times Donaldson committed a throwing error the first play that went his way. The Morales injury could be a blessing in disguise. 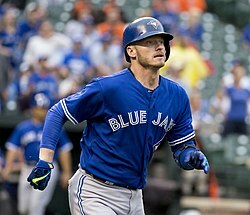 Players like Donaldson and Devon Travis need to be handled cautiously. As suggested in this week's random thoughts post, John Gibbons might opt to DH Travis on days he is scheduled to have off to keep his bat in the lineup. Same goes for catcher Russell Martin, who is following a similar playing schedule as Travis. Look for the Blue Jays to take every precaution with Morales and put him on the DL. Both starting pitchers pitched very well today. The 2 starters combined to strike out 19 batters. Both pitchers were having quick, efficient innings that allowed them to pitch later in the game. Happ had his best start of the season, throwiing 6 solid innings and getting 9 strikeouts for the second straight start. He will be a major part of the success for the Blue Jays this season. Props to the Orioles defense who made 2 huge defensive plays: Bundy threw out Pierce at home in the 2nd and in the 8th Trey Mancini threw out Almedys Diaz, who was attempting to score on a sac fly. It's these kind of plays that win most ball games. Up next, Aaron Sanchez makes his third start of the season against fellow righty Andrew Cashner as the Blue Jays look to continue to have success on this road trip. They are 3-1 so far on the trip.